What do you guys think? Is it too early for pumpkin things? Please say no, because I’ve patiently been waiting for fall to arrive, and for me, it’s close enough. I can’t contain my excitement any longer. I’ve made muesli bread before (serious yum) but have never gone about making it into a traditional cereal. I figured I at least owed you all that much, especially considering I’ve nearly exhausted all flavors of granola (story of my life). 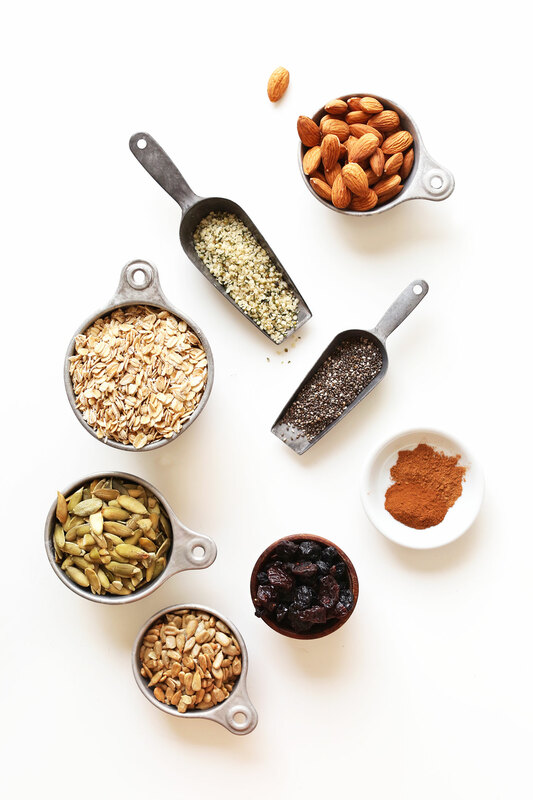 Muesli is similar to granola, only it’s typically unsweetened, includes no oil, and it’s raw. But for me, the idea of raw oats isn’t too appealing (unless they’re soaked overnight). So, I went for a light toast to add more flavor and crunch. This recipe comes together in 20 minutes and requires less than 10 ingredients. Plus, it’s healthy! With no added sugar or oil, it’s the perfect way to start your day with plenty of fiber, healthy fats, and protein (nearly 9 grams protein per 1/2 cup). The addition of dried fruit adds subtle sweetness, while pumpkin pie spice and pepitas infuse plenty of fall flavor. I can hardly contain myself with pumpkin pie spice. I’ll be putting it on everything from now until Christmas – not even kidding. If you try this recipe, let us know! Leave a comment and rate it, and don’t forget to take a picture and tag it #minimalistbaker on Instagram! We love seeing what you come up with. And if you like this recipe, be sure to check out our other seasonal breakfast items, including Pumpkin Apple Muffins, Sweet Potato Granola, Pumpkin Maple Pecan Granola, and Pumpkin Cinnamon Rolls. Cheers, friends! 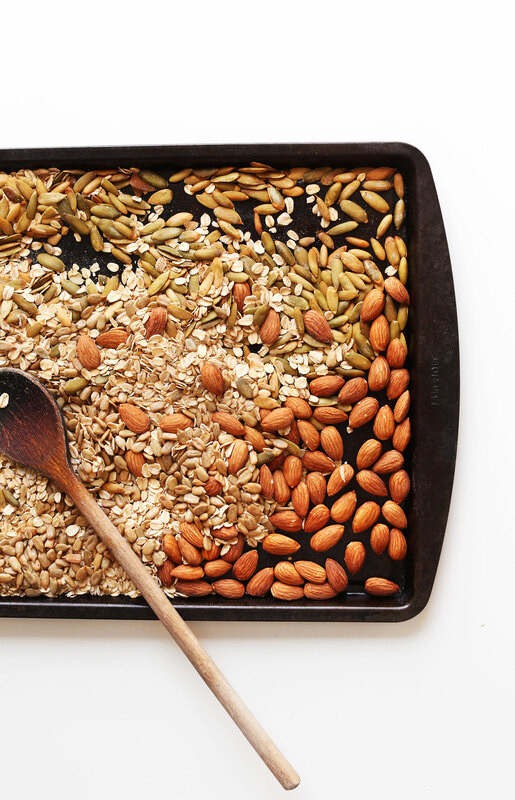 Healthy, 20-minute toasted muesli with pumpkin seeds and pumpkin pie spice for a fall flavor infusion. A hearty, simple breakfast or snack. Preheat oven to 325 degrees F (162 C). 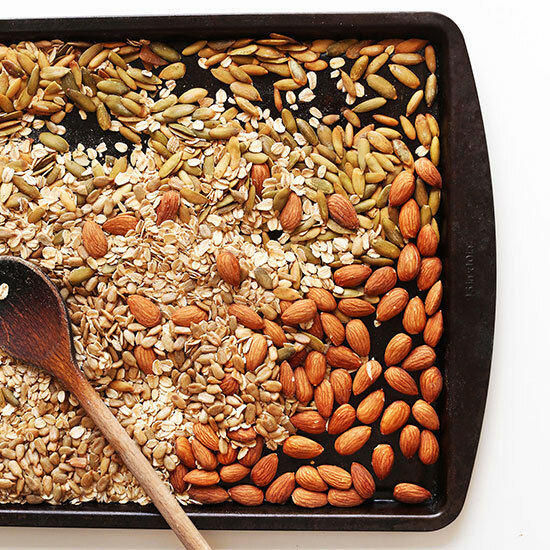 Arrange oats, pumpkin seeds, almonds, and sunflower seeds on baking sheet and spread into an even layer. If any of your nuts or seeds are already roasted, do not add them to the pan and reserve to add later. Bake for 10-15 minutes or until lightly toasted and golden brown, stirring once at the halfway point. Remove from oven and cool slightly. Then add to a large mixing bowl. Add all remaining ingredients: hemp seeds, chia seeds (optional), dried fruit (optional), cinnamon, and pumpkin pie spice. Toss to combine. Serve muesli with dairy-free milk or yogurt. Fresh fruit goes a long way with this muesli since there's no added sweeteners otherwise. I prefer mine with almond milk, banana, raspberries, and a sprinkle of coconut sugar to taste. To further soften the oats, heat milk before adding to muesli. Alternatively, cover with dairy-free milk of choice and allow to soak for 30 minutes at room temperature or covered in the refrigerator overnight. *Nutrition information is a rough estimate calculated with dried fruit and without any additional toppings. Hi since i don’t have time to make this every morning, can i pre toast the oats and then put them in a jar? How long will they be good for? Yes! I think at least one month. Good luck! I made this recipe this morning and it’s delicious!! So quick and easy to make! I also made fresh oat milk and it took this cereal over the top! I really liked this recipe. I didn’t have all of the stuff you mentioned above, just the nuts and the oatmeal. I cooked it on the stove in the morning in a cup of coconut milk. It was a nice cereal. Not as sweet but I liked it that way too. I’m sure you’ve got plenty more granola recipes in you yet!!! I’ll just have to live with this muesli till then….. though it’s not really any hardship!!!! 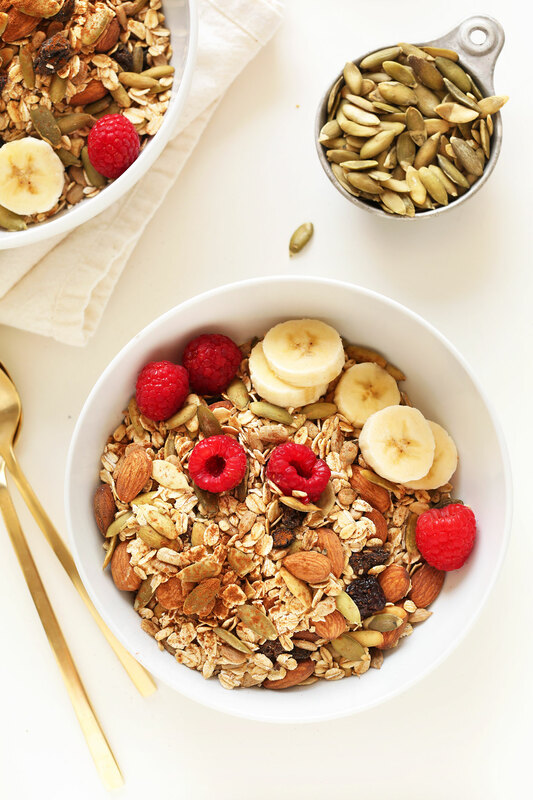 Muesli is perfect for topping on oatmeal, smoothies and yogurt! I actually add it on pancakes too for extra decoration. This one looks perfect for the fall! This recipe looks amazing! Where did you get those lovely gold spoons? Made this the other day. So good! I added some honey (or agave/maple syrup if vegan) to give it some sticky, sweetness. Been pouring almond milk over it all week! Wonderful! Thanks for sharing, Carrie!! HAHAHA YAY for pumpkin I say! This was so delicious! I LOVE all of your recipes and photos!!! Yay! Thanks for sharing and for the kind words, Catherine! This looks like a great breakfast. Whip it up over the weekend and have it ready for the rest of the week! Great idea! Let me know how you like it, Tracy! Hi Dana, could you create a recipe for chickpea-based blondies? I made a batch according to a recipe on the internet, but it wasn’t good :( Love the idea, though. Maybe pumpkin spice would work there, too? Its never too early for pumpkin! 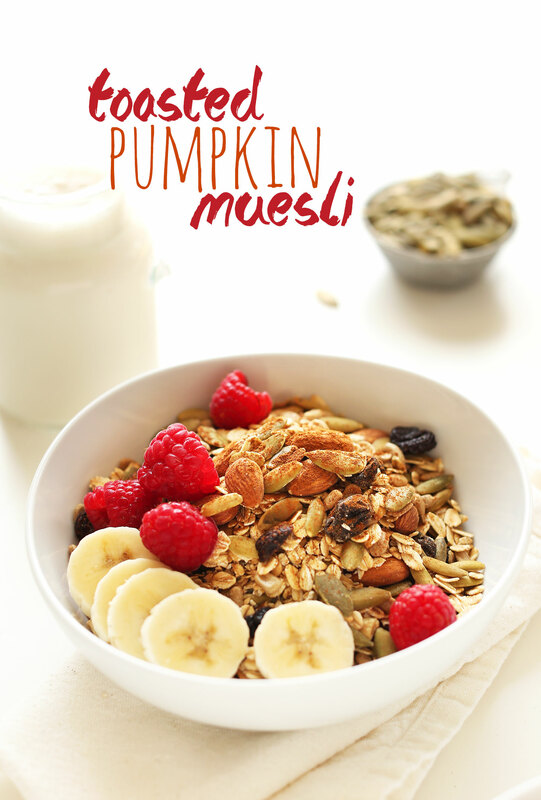 I can’t wait to sprinkle this toasted pumpkin muesli on everthing and anything! In my opinion it’s never too early for pumpkin! I am addicted to pumpkin pie spice too. I’ve even mixed it into my peanut butter to eat it with an apple. Yum! This recipe looks delicious. Gorgeous pictures, as usual! ? Whoop! Glad you’re on board. Hope you love this Emily! Perfect. This combination is just perfect. I guess autumn is really here. I hear about and see pumpkin everywhere. Thanks Kristina! Hope you give it a try! Pumpkin pie spice so early? You’re a naughty one! I haven’t had muesli in a long time because I only discovered overnight oats a few months ago and have been binging on different combos! I’m a big fan of muesli and, like you, I prefer it toasted. Your combination sounds great! Pumpkin pie spice isn’t a thing over here though, so I’ll have to mix my own. When making the spice there are two versions one with cinnamon, ginger and nutmet with clove or with allspice or both! Grind it and it’s good in a jar for about a month or two if it lasts that long!! Never too early for pumpkin things! I’ve been making pumpkin spice since the first of September – hell yeah, I love autumn! Oh my gosh- I’m ridiculously excited for pumpkin season- you’ve been waiting much more patiently than me, I suspect! So glad you jumped on the boat and are sharing a recipe nice and early! 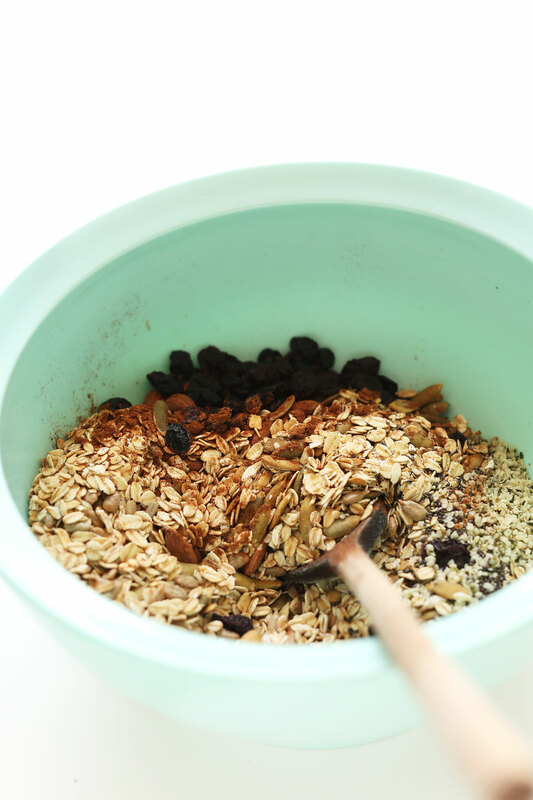 Muesli is one of my all-time favorite breakfast recipes. This looks amazing! I also think it makes a great dessert at night before bed:) Lovely photos and fall ingredients! This recipe looks delicious. And with no added sugar… that’s great. This sounds really good and I like the idea of toasting the oats for a slightly different taste than the usual raw muesli! Forgot to add…..my husband adds milk to his homemade muesli (which is RAW) the night before then eats it at work the next morning. I like it raw….but I know some people won’t. Toasting the oats is a great way to get people to try this healthy, easy, inexpensive breakfast. Thanks again! Yum! I have been making homemade muesli for years. I add different things each time I make a batch (and a scoop of vegan protein powder) but I’ve never thought of adding pumpkin spice! I’m making this recipe for the next batch. I love fall….it’s always so beautiful here in Portland. Yep….fellow Portlander here! Your blog is a favorite of mine and I’ve made many, many of your recipes and always consult it when I’m doing my weekly food shopping. Thanks for so many yummy meals! Love this combination of flavors in this recipe! This will be perfect breakfast to last the week! Thanks for the recipe! This looks amazing! I love all the different seeds you added to make it crunchier. This sounds absolutely delicious! Just got back from Germany and our hotel breakfast was all about muesli and I know I’ll be making this! Nope, definitely NOT too early for pumpkin things (I say as I sip a pumpkin breakfast smoothie), And meseli is the perfect treat for the coming fall. Love this!